Petite Bronze and Copper Decorative Vase with Nazca Figures, "Nazca Legacy"
Add a unique cultural accent to your home with this small, artisan-crafted decorative vase embellished with symbols from a World Heritage site. The ancient Nazca geoglyphs are located in southern Peru and consist of hundreds of figures scratched on the ground depicting animals and plants, both real and imaginary, along with geometric forms. These motifs are recreated in a golden tone on the sides of this copper and bronze vase by Peruvian artisan Angel Franco. Copper-colored top and bottom borders contrast with the petite vessel's beautiful green oxidation, and vertical braiding serves to separate the three embossed figures which resemble a monkey, bird, and spider. 8.5 cm H x 7 cm Diam. 3.3" H x 2.8" Diam. 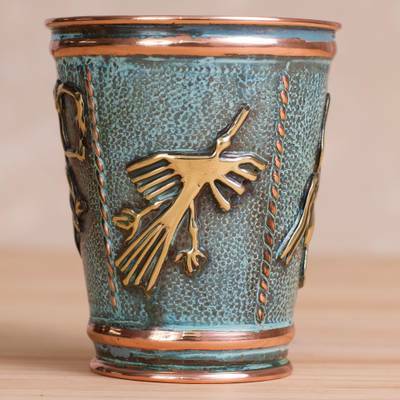 You can find copper and bronze mini decorative vase 'Nazca Legacy' by Angel Franco in vases categories such as Cultural Vases, Archaeological Vases, Animal Themed Vases, Copper Vases and Bronze Vases. Enjoy exploring these sections for other Novica treasures.